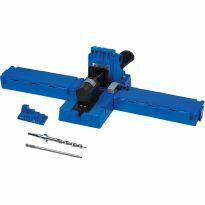 Clamp and align pocket hole joints faster, with better accuracy, and control! 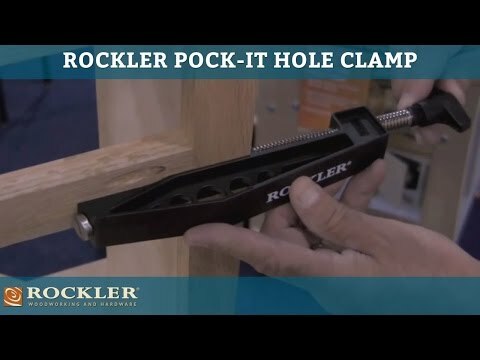 The Pock-it Hole Clamp® with a new Quick Release features a unique design that inserts a built-in adjustable pin into a 3/8" x 15° pocket hole, giving you perfect alignment every time. Now setups are even quicker and easier with the new quick-release slide button to snug up your fit, then use the ratcheting handle for final tightening. 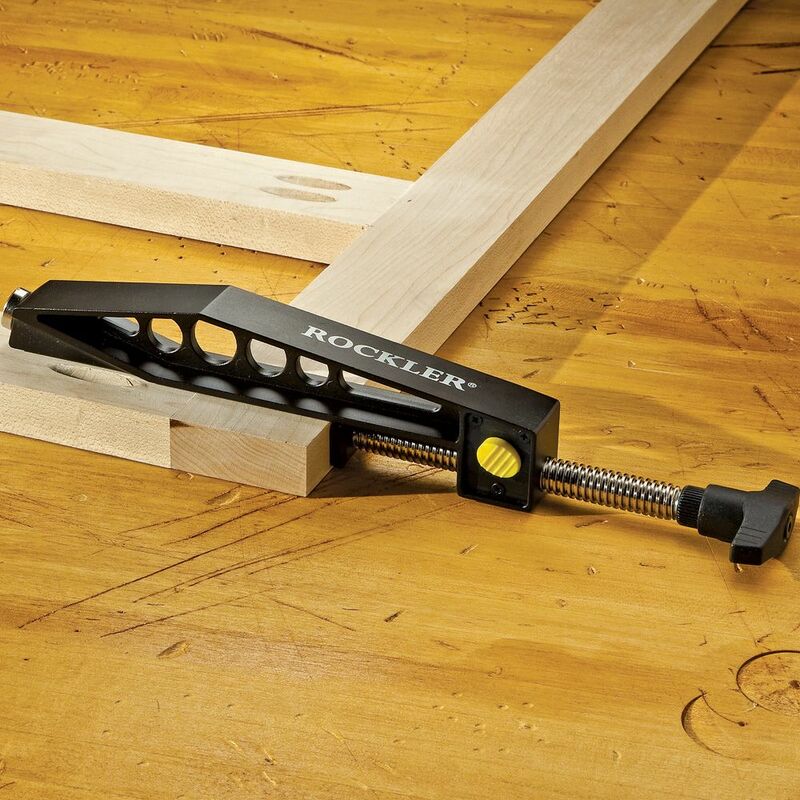 The clamp has all the clearance you need to clamp and fasten double joints in one easy step. Simply clamp the joint using one hole, then insert a screw in the other hole and tighten. 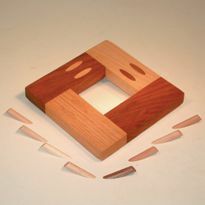 Works perfectly with 3/8" pocket holes on 3/4" thick face frames and casework, and stock up to 3" wide. Well built tool. 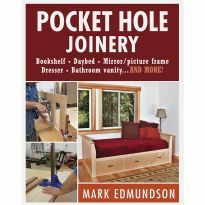 I recommend this tool to anyone making pocket holes. Very specific tool but very useful if you use pocket holes often. Really a very handy tool, makes making a face frame easy. Great tool. Very easy to use. This clamp works great with KREG fasteners. The pocket hole clamp works fantastic.It snugs the joint up tight and secure. I'm pleased with it. Bought two and they make cabinet frames a snap...... and square. Recommend. the clamp worked as advertised. held joint nice and tight while i drove in the pocket screw. get two and it will make your project that much easier to do. I have the older version of this and I rated that with 5 stars. This is the improved model and it should get 6+stars. My new model works as well as the old but the quick release is the icing on the cake. This clamp works better than the original face clamp alone but it does pull up a little because of the angle. If at all possible to use a face clamp with it, you can get an exceptionally flat and tight joint. where were these at when they invented to pocket hole? I like the ease of use of this product. Makes it a lot easier. I wish I had this last year! It is easy to use and does a great job keeping everything flush. Good clamp, nice and tight. Quick and easy to use. Does a fine job in regular use. I originally purchased these primarily for face frames. but found they work equally as well to hold larger vertical panels in place while I clamped and aligned sides for attachment ( one man shop and not enough hands) I also drilled some pocket holes in a plywood angle brace and used them to hold it in place in lieu of bar clamps. Worked great! A really viable alternative to clamps and a lot easier to use. Good value for the money. Used this on 1 1/4" x 3" stock by unscrewing the pin and screwing it back in to clamp.I am building two screen doors and this worked great clamping for my pocket screws. 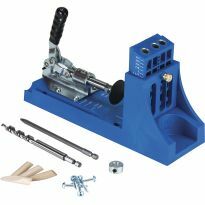 If you use a Kreg Pocket hole tool this is a must have. Very well made and sturdy. Just what the doctor ordered for this application. Holding parts during assembly is always challenging. This quick release clamp saves time and insurers a perfect fit. I had a friend of mine cut me up a frame for a large bathroom mirror that I plan on putting a Granicrete faux marble finish on and needed something sturdy to keep it all together. So he let me use his Kreg tool and I bought this to hold it in place while I fasten it. It was effortless to keep the pieces in line. 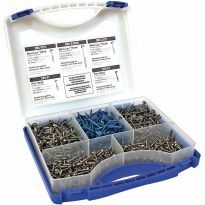 I now own the Kreg fastener tool as well. Work smarter, not harder. What an amazing idea from the Rockler Gang on engineers. 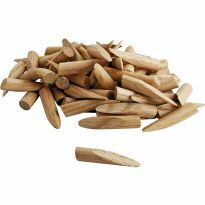 Perfect for cabinet and picture frame work. Love them! 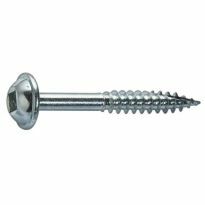 I use pocket hole screws in many of my projects. 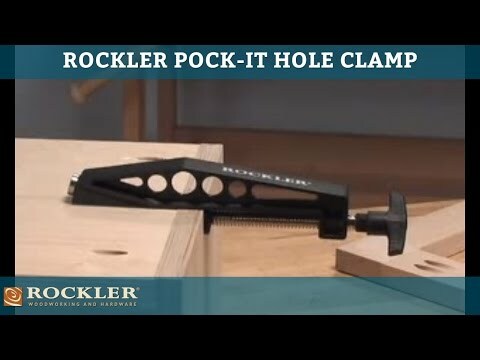 The Pock-it Hole Clamp is the best accessory I have found to hold the joint in place while putting in the screw. It keeps the workpieces tight and aligned allowing for a very nice joint. To provide a 'third hand' in the assembly of face frames. Looks like a better clamp than the Kreg clamp I am using. Have an upcoming project for which these should be useful. 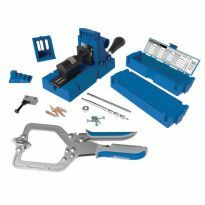 This will enable additional ease of using the Kreg system and insure accuracy. Have not had a chance use them yet but they look like they will help with getting a good tight fit when gluing joints with pocket holes. Looks cool - many it will make things easier. I had ordered 2 clamps and decided I needed 2 more. Great reviews and a very clever design. Looks to be faster and easier than using the vise pliers. Ingenious idea... I always need an extra hand in the shop since I mainly work by myself! The old clamps slip too much. 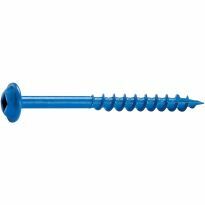 I have trouble holding project together when using pocket-hole screws and this looks like a great item to stop the wood from shifting when tightening the screws. To help keep the alignment together when putting the screws in. Should be a good time saver, delivering precision results, in assembling pocket holed components of my projects. it's solves a common problem that is long overdue to be solved. 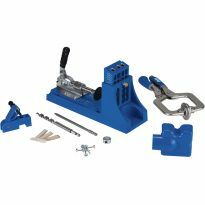 Looks to be a well built clamp that will make pocket holes easier to align and keep tight, and the discounted price was right. To get it right and tight the first time. Tired of fighting clamping joints and the Kreg clamp keeps tearing out the wood when i release it. Great clamp for pocket holes! 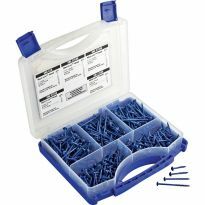 Does Kreg have a joinery kit for making picture frames? On face framing, will it span 3.5 inches wide lumber? 3.5 X .75? I have a Kreg and this clamp will work faster on 3.5 X .75 lumber. 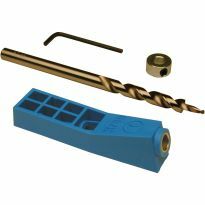 KREG's depth will allow to join a .75 x 3.5 (1x4) to a 3.5 x 3.5. (4x4)? BEST ANSWER: Yes and No I the package for the clamp clearlyindicates that it will except 3" wide stock capacity; however, it will actually except stock width of 3 5/8" while anchored to an empty pocket hole at the clamps end and the clamping hands-free end. I don't own this clamp, though I'm thinking about buying it. If you are clamping the 3.5 x .75 to the "face" of the 4x4, I would support the .75 inch board so that its surface is flush with that of the 4x4. If you rely on the clamp to hold the board flush, it may have a hard time doing that. That would take a 3" thick board (or other support). Otherwise, there should be no problem. 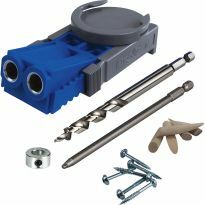 Can the peg be modified to work with the Kreg micro jig? BEST ANSWER: I use this with my Kreg holes. 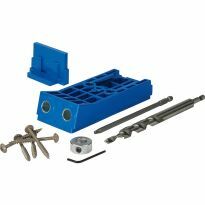 The jig is designed for the standard Kreg hole (3/8"). My question is can the pin be removed and modified so it will work with the micro Kreg hole (7mm)? Will it work on 1" thick stock? BEST ANSWER: This clamp rides on the top of the wood with a pin in one of the drilled holes. I have clamped wood thicker than 1 inch up to about 2 inches. Considering the design I would not think there is a limit. how do you know what depth to set the pin? BEST ANSWER: The pin is set and just holds and clamps the pcs. together. Good for alignment. Can this be used on an inside corner such as a drawer in a cabinet? BEST ANSWER: I don’t see how, it relies on two parallel pocket screw holes. The clamp locks into one while you set a screw in the other. I think it pretty much has to be used as shown in the picture. The picture does not look like a drawer I am making for my cabinet. If I was building a picture frame I would agree. Does it work with 2x2 stock ? BEST ANSWER: I haven't found any stock that it won't work on. It's like an extra pair of hands when you are assembling a project. will this work with 1/2 inch stock? How do you keep the clamp from marking wood? BEST ANSWER: I KEEP A SMALL SUPPLY OF THIN WOOD SHIMS ON MY WOOK TABLE TO SLIP BETWEEN THE CLAMP FACE AND THE WORKING MATERIAL WHEN CLAMPING THINGS UP. Does this clamp come with a 19/64” inert adapter for the micro jigs, or is there an insert accessory for changing to micro pocket holes? BEST ANSWER: Mine did not come with adapters - I think it's probably intended to work with the standard Kregg-type pocket holes and not necessarily with the micro (or heavy duty) pocket holes. I used to do a lot of joinery with pocket holes and I used these clamps all the time - very handy. I've switched to mortise and tenon for most of my joinery now and have a couple different tools for this.